We are now midway through the Twelve Days from Christmas to Epiphany. Epiphany is a Greek word that means “appearance.” The feast celebrates three manifestations: the Baptism of Jesus in the Jordan, the first miracle at Cana, and the Adoration of the Magi. At first, this seems a jumble. But we can better understand it by understanding what it has to do with Christmas. In the West, we have traditionally given greatest prominence to the day of Christ’s birth. In the East, they have focused more on the Adoration of the Magi (the visit of the wise men) which is celebrated twelve days after the Birth. To Western minds, it seems strange to celebrate twelve days after the birth. The Birth is the big deal, right? But in fact, in one sense, the Birth is not the big deal. The big deal is the Incarnation, which happened nine months before the birth. The Word was not made flesh on Christmas, but months before, in Mary’s womb. Theologically, the feast of the Annunciation, March 25, is a much bigger deal. In other words, whether we celebrate twelve days after the Birth or on the day of the Birth itself, we’re still celebrating long after the real action has taken place. 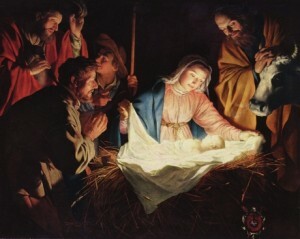 In one sense, nothing happens on Christmas Day – just as, in a similar sense, nothing happens when a baby is born. It’s not like there wasn’t a baby before the birth. And yet birth is a big deal. (Let our pro-life fervor never lead us to say “nothing happens” at birth.) It’s a big deal because . . . it is an Epiphany, an appearance. What happens when a child is born is that, for the first time, mother and child look into each other’s eyes. That is not nothing. In some sense, that is everything. That is the whole meaning of human life. Finally the child is doing what it was made to do. And let not our theological correctness lead us to say “nothing happens” at Christmas. For the first time, mother and child look into one another’s eyes. In some sense, that is everything. That is why Christ took flesh. In perhaps the most important twentieth-century book on sacramental theology, the Dominican Colman O’Neill ponders St. Paul’s bizarre phrase, “make up what is lacking in the suffering of Christ.” Nothing is lacking in the suffering of Christ – except one thing: u-r. This is the heart of Catholic soteriology. Why do our works – or, more properly, our sanctification – matter? Because the one thing lacking from Christ’s work is for it to penetrate us. What is lacking? You are. It is the heart of sacramental theology. Christ has done everything on the Cross. The only thing lacking is for us to receive his power. What is missing from the power of the Cross? You are. It is the heart of liturgical theology. Traditionalists sometimes get confused on this. The Eucharist is everything, they correctly say. We can add nothing. So who cares about “active participation,” the key word to Vatican II’s document on the liturgy? But there is one thing lacking from the Eucharist: you are. Active participation contributes nothing to the power of Christ in the sacraments – or, it contributes nothing except for letting that power flow into us. The Eucharist doesn’t save the world on its own – else we would be Universalists, or at least Lutherans. No, what is missing from the Eucharist is us. And so, too, this is the heart of Christmas. 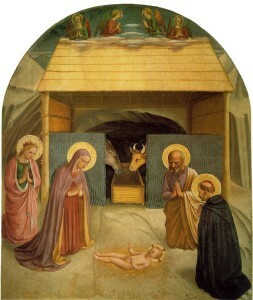 What is lacking from the Incarnation, on March 25? We are. Christ joins himself to human flesh at the very beginning of his earthly journey. But that is not the end of the story. He has still to look into his mother’s eyes. For the mother, what happens at the birth of her child? Metaphysically, nothing. Personally, everything. The whole point of taking flesh is to enter into union. And so we see in what sense the East gets it right with their emphasis on the Epiphany. What is the point of Christmas? The point is that now we can see him – now all the nations, like the three kings, can join Mary in gazing on the face of Christ. What does the face of Christ mean for you? The first Sunday after Christmas, we celebrate the feast of the Holy Family. As Jesus enters into a family, and we celebrate Christmas together as family, it seems appropriate to celebrate the beauty of family, the original vocation. But all is not as expected. The first reading, from Samuel, is the dedication of the child Samuel. Hannah has prayed for a child – prayed for the gift of family. It says she called him Samuel, “since she had asked the Lord for him” – implying that in Hebrew “Samuel” means something like, “I asked, God answered.” But when God grants her prayer, she turns it upside down. Our Gospel reading will have the Holy Family praying together. “Each year Jesus’ parents went to Jerusalem for the feast of Passover.” Family and faith in beautiful unity. But that is not the case with Hannah. “The next time her husband Elkanah was going up with the rest of his household to offer the customary sacrifice to the Lord and to fulfill his vows, Hannah did not go.” God grants her prayer for family, and she responds by not praying together with her husband. This is a strange reading for a celebration of family. In their attempt to resolve the problem, we see the unity of the family: they “looked for him among their relatives and acquaintances.” Such a joyful procession of family and acquaintances, a village of human affection, going up to pray in Jerusalem. And Jesus is not there. Mary’s words when at last they find him, three days later, in the Temple, are a key to understanding St. Joseph’s place in the love of the Holy Family. 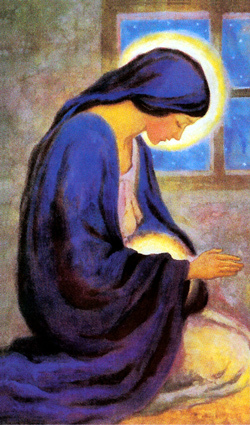 “Your father and I have been looking for you with great anxiety.” Mary speaks for the heart of Joseph. She and Joseph share one anxiety for their child. Heart speaks to heart; this is a marriage of profound friendship. And a depth of family, too. It is of course biologically untrue to call Joseph “your father.” And yet in the love of the Holy Family – for example, in their loving anxiety for one another – Joseph is Jesus’s father. These are not cold, formal relationship. In Mary’s short words are a whole world of humanity, of family affection. But Jesus is not there. The anxiety of the parents for their child is tied to the words, “Why have you done this to us?” – forever the words of parents to children who do not respect their family ties. Here is the heart of the matter: Jesus is Son of Man, but also Son of God. He who takes flesh and blesses this world comes from outside of this world, and calls us beyond this world. This is what “his mother kept . . . in her heart”: the tension of man and God, human family and divine vocation. For the Epistle, we had a choice between Colossians and First John – but the message of both is about the same. On the one hand are the virtues of family love: “heartfelt compassion, kindness, humility, gentleness, and patience, bearing with one another and forgiving one another” (Col. 3); “love one another just as he commanded us” (1 Jn 3). In short, the only way to discover family is through holiness; we can only know the beauty of father, mother, child, and love if we keep foremost the Father and the Son and the Holy Spirit. Our families can only thrive if we live a calling higher than family. In what ways does your family need you to look beyond family, to your divine vocation?